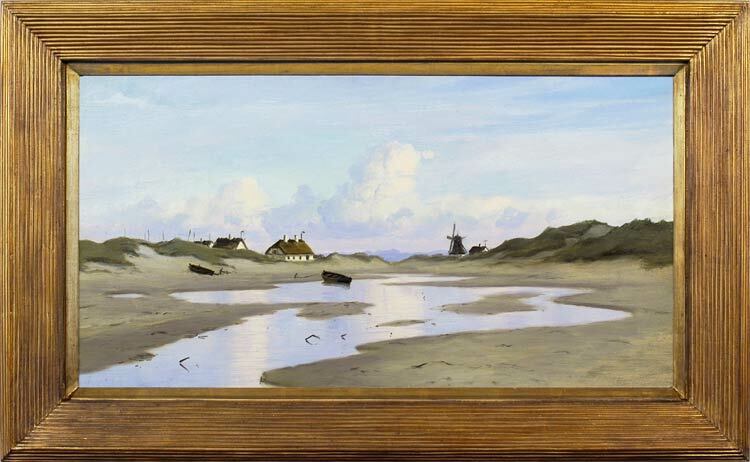 A characteristic but particularly lovely example of Olsen’s coastal paintings, in his preferred extended horizontal format, this panoramic sweep of dunes around an estuary or inland pool radiates a profound tranquillity. It may have been painted near Skagen, which was noted for its artists’ colony in the late 19th century, as well as for its clusters of low fishermen’s cottages with their disproportionately large roofs – just as Olsen has depicted them in this landscape. Skagen is sited at the end of a peninsular at the northern tip of Denmark, allowing for constantly varying conditions of light, weather and tide, all of which would have appealed to Olsen, with his sensitivity to the effects of climate and time of day. It also boasts a windmill very similar to that shown in his painting. The composition, with its large areas of sky and water, emphasize the clarity of light for which Skagen was famous, and contribute to the serenity of the work. The evidence of human life is diminished in comparison, but fits comfortably into the natural world – cottages, windmill and beached rowing boats indicating a life tied intimately to the elements.